Barnes Bay Beneficence Villa For Sale – Anguilla – Welcome to the ultimate island retreat, one of the Caribbean’s most spectacular residences, on coveted Barnes Bay, Anguilla, British West Indies. Easily accessible from Europe and the United States by commercial and private jet, this architectural masterpiece is perched on a bluff above a secluded beach on the island’s exclusive West End. Designed by the celebrated architect Ronald O. Van Pelt of Wimberly, Allison Tong and Goo, with landscaping by internationally known Larry Steinle, this island haven is perched on the longest residential waterfront property on Barnes Bay, Anguilla. The superb architecture and engineering harmonizes with the natural terrain, providing panoramic ocean views from every vantage point. The 28,000 square feet of living space includes two master suites, four private guest suites, enormous family room, oversized living room, library, private office, state of the art kitchen and a fully equipped apartment for a caretaker. Enjoy the gentle prevailing trade winds as you move through the open areas of this remarkable home with its numerous public and private spaces—all with panoramic water views—set in a lush tropical environment. Enter through massive mahogany gates to a cobblestone courtyard. Wander through the open air breezeways formed by stone arches and Italian limestone flooring through out, connecting the four pavilions. This fabulous compound consists of four wings, each of which features, Custom African mahogany millwork. Dine in three open-air locales overlooking the Caribbean Sea. Listen to the music of a winding stream as it cascades under a bridge to the lower swimming pool nestled into the bluff. Drink in the beauty of the tropical flower garden bursting with color. Enjoy the coconuts, pineapples, bananas, papayas, figs, plantain, vegetables, herbs, and other bounty provided by the Estate’s orchard. North Wing features two levels, with a grand family room, bar, living room, 18-seat dining room, formal library/media room with first rate audiovisual equipment. Each of these rooms has its own terrace, revealing stunning views of the ocean from every perspective. 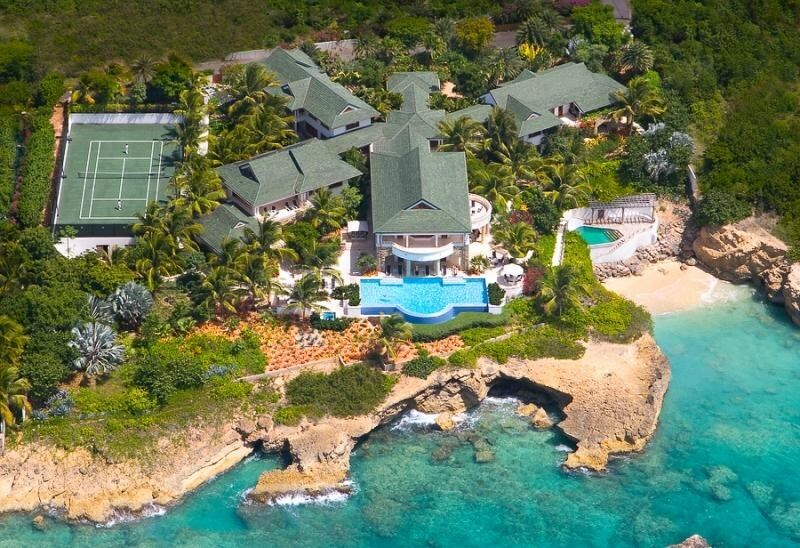 Anguilla, For Sale, Real Estate, Villas. Bookmark.